Revelations by Edward Snowden, National Security Agency dissident, have grave implications for the role of journalists in the ‘Fourth Estate’ and the primary duty of source protection in the era of mass-surveillance. One of the most dramatic moments in Paul Greengrass’ 2007 film The Bourne Ultimatum sees Guardian journalist Simon Ross assassinated - a neat bullet in the head from a skilled sniper from a rogue Central Intelligence Agency (CIA) unit - as Ross attempts to rendezvous with Jason Bourne on a crowded Waterloo Station. Ross’ error is to have used the word ‘Blackbriar’ on his mobile phone, alerting CIA to his knowledge of the illegal, highly secret CIA operation. One of the most dramatic moments in Paul Greengrass’ 2007 film The Bourne Ultimatum sees Guardian journalist Simon Ross assassinated - a neat bullet in the head from a skilled sniper from a rogue Central Intelligence Agency (CIA) unit - as Ross attempts to rendezvous with Jason Bourne on a crowded Waterloo Station. Ross’ error is to have used the word ‘Blackbriar’ on his mobile phone, alerting CIA to his knowledge of the illegal, highly secret CIA operation. His mention has been picked up by the all-pervasive eavesdropping of the National Security Agency (NSA). 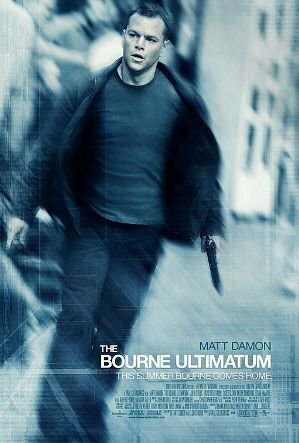 In the nail-biting minutes leading to Ross’s death and Bourne’s narrow escape the plot reveals that the CIA team has the ability to tap into Britain’s extensive surveillance infrastructure at will. Greengrass’ chilling film looks prescient in light of the information that has been leaked by the NSA dissident Edward Snowden since June and extensively reported by The Guardian and elsewhere across the world. In the last couple of weeks David Cameron and intelligence chiefs have lined up to claim, “The Guardian has harmed national security” by revealing the methods used by NSA, GCHQ and others (one cannot help but think that some real intelligence officials might wish they could assassinate a Guardian journalist or two as in The Bourne Ultimatum). Despite what Cameron and others say, what is important about Snowden’s leaked documents is what they revealed about the sheer power and ubiquitous nature of the modern surveillance state. It is now apparent that details of most emails, many phone calls and much, much more are being sucked into huge data stores that allow the agencies to sift for useful information. Snowden has also revealed that the agencies have secretly negotiated for ‘backdoors’ in the security of many computer programmes, social networking sites, websites and even smartphones. This near total capability to access everyone’s private conversations is justified on the grounds of fighting the ‘war on terror’ and organised crime. In the twelve years since 9/11 the world has been transformed into a Panoptican. We have entered the era of mass surveillance and that is a very different beast from selected surveillance of identified targets. Such is the exponential leap in surveillance power, the publics involved are only just beginning to absorb the implications. This can be seen in the public debate that Snowden has sparked in the US and many other countries, though the UK has been slow to enter that debate. There is now no such thing as privacy and we seem to have dispensed with the concept very lightly. John Lanchester in his recent Guardian essay questioned the fact that all this is justified by the disruption of terrorist plots. “Is that enough of a justification for the scale and extent of what is happening to our privacy?” He asked. “Is the current supervisory regime which involves senior judges inspecting GCHQ’s actions, ‘within the circle of secrecy’, and issuing a secret report – adequate to the scale of the state’s powers?” The man in charge of Parliamentary scrutiny, Sir Malcolm Rifkind, chair of the Intelligence and Security Committee (ISC), is so busy telling us to be reassured that it actually exacerbates my concern. Shouldn’t he listen more to the disquiet, rather than trying to override it? It is my contention that the mass surveillance state now has the tools and the ability to prevent effective investigative journalism when it chooses. That is especially true when these investigations target the state itself. In Britain serious journalists justify the importance of their trade with the ‘Fourth Estate’ concept. This role, first noted by Thomas Carlyle in the 1850s, is the independence of the media to exercise the accountability of the other three ‘estates’ - parliament, the church and the peers. One of the most powerful tools used by investigative journalists, indeed all effective journalists, has been their sources. As a profession we have always tried to get insiders, whether in government departments, law enforcement or intelligence agencies or elsewhere, to tell us what is really happening in organisations as opposed to what that organisation wants us to think is going on. But these sources are rarely whistleblowers like Snowden, who are prepared to go public and suffer the consequences. Commonly, it’s a quiet word to let a friendly and knowledgeable journalist know that something is wrong and needs to be dealt with. Sometimes it is motivated by office politics, but nonetheless in the course of that disclosure important information is revealed about incompetence. Very, very few of my insider contacts would have described themselves as whistle-blowers. Most would have fainted if I had described them as such. Chapman Pincher was the first journalist to master the art of the ‘exclusive by leak’ from politicians and officials. Pincher who is now in his mid-90s detailed not so long ago how he got his exclusive stories for four decades (Dover 2009). For most of my career I too nurtured sources within law enforcement, intelligence and other public sector agencies. I got many “in the public interest” stories from these sources. What is really important is that I could guarantee my sources anonymity. I knew that I had to protect my sources and employed a range of common sense approaches about communicating and anti-surveillance techniques about meeting up that worked. Even when I looked into wrongdoing by the security forces in Northern Ireland, I never exposed a source. Such is the power of the modern mass surveillance state that I am no longer sure that it is possible to protect one’s sources. We live in an electronic world and it is almost impossible to communicate in any other way. One is tracked by one’s own phone. If our online communications can be read even if encrypted, what can a journalist promise a source? And it is not just electronic communication. In central London and many other places, just like Simon Ross, your every move can be followed by CCTV. Your car number plate is tracked as you drive around. It might seem like a bad joke, but if you are deemed a serious risk to a government department there is nothing to stop your being tracked by helicopter or even a surveillance drone. While my interest focuses on the UK it is abundantly apparent that surveillance does not respect borders. According to Der Spiegel, the NSA hacked the computers of Al-Jazeera journalists in Qatar in the search for terrorism contacts. One such document, dated March 23, 2006, reveals that the NSA's Network Analysis Center managed to access and read communication by "interesting targets" that was specially protected by the news organization. If eavesdroppers are able to identify sources and locations of sources, this has serious ramifications. Journalists may well have contacts in terrorist groups as a legitimate part of their work. But what happens if their contacts are hacked, identified and eliminated? How should journalists react if they now know that a source may be tracked and killed in a drone attack because eavesdropping agencies have broken into our ‘secure’ communications? The group argue that NSA mass surveillance is illegal when it comes to journalists sources which are protected in various ways under US law. But the situation in the UK is more fraught. Sources are not protected under law but more by certain precedents. So the journalism-source relationship has no or very limited protection. The appalling antics of Murdoch’s News of the World journalists and others over phone-hacking have left serious journalists floundering for public support. So this fundamental challenge to our profession could not have come at a worse time, while everyone is distracted by the Royal Charter press regulator debate. Back in the world of cloak, dagger and bigdata, the simple premise of David Cameron, government and the intelligence agencies is that they should be able to engage in mass surveillance in the greater public interest. A second premise is that the government should be protected from leaks. This is all predicated on the assumption which we are supposed to share, that current oversight works. After thirty five years of reporting on intelligence I do not find the current oversight regime convincing. It flies in the face of history, which shows that government and intelligence have never been subjected to effective oversight over any length of time. Time and time again it has been journalists who have revealed incompetence, corruption and malfeasance in these agencies. My insider sources helped me when working for the Independent on Sunday understand that the leadership at MI6 had become political in providing ‘evidence’ justifying the Iraq War in 2003. Somehow, since 9/11, fear has dulled the memory of the public into believing that government and intelligence do not need independent oversight. But one thing three decades in journalism has taught me is that Lord Acton was right. “Power tends to corrupt. Absolute power tends to corrupt absolutely”. We have to have eternal vigilance. You do not have to go back to the Cambridge Spies, Spycatcher, MI5 and the Miner’s strike, or MI6 and rendition to find examples. Look at the undercover police officers who worked in campaigning groups, engaging in relationships, fathering children and acting as agent provocateurs as part of the surveillance state? Where was the oversight? I would like to trust government and intelligence agencies in all matters, but based on experience, I do not. Those who work in secret always try to extend their mission. Journalists are the only ones with a record of consistently exposing mission creep and wrongdoing. Like Emily Bell and her colleagues in the United States I believe mass surveillance is a serious threat to democracy itself. We need a debate, and not just a debate: we most likely need a law that makes intercepting journalists’ communications illegal. Dover, R. and Goodman, M.S. (Eds). (2009) Spinning intelligence: Why Intelligence needs the media, Why the media needs intelligence, London: Hurst & Co.